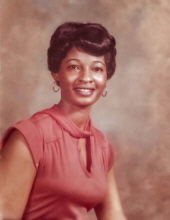 Estella Louise Small Floyd, 72, of 584 George Floyd Rd. died February 4, 2019 at Maria Parham Health. She was born in Vance County to the late Richard Dixon Small and Geneva Terry Small. A funeral service will be held at 2 pm, February 16, 2019 at Brookston Baptist Church. Interment will follow in the church cemetery. Survivors include her husband, Jesse Floyd, children: Llewellyn “Poochie” Small, Letie “Tyrone” Floyd and Jesse Floyd; 12 grandchildren, six great-grandchildren, one great great-grandchild; three sisters: Ida Marie Jones, Corine Green and Patricia Jones. Viewing will be from noon to 6 pm, Friday, February 15 in the funeral home chapel and at the church prior to the service. To send flowers or a remembrance gift to the family of Estella Louise Small Floyd, please visit our Tribute Store. "Email Address" would like to share the life celebration of Estella Louise Small Floyd. Click on the "link" to go to share a favorite memory or leave a condolence message for the family.